While most customers expect their executive cars to do their job without attracting lots of attention, some turn to the likes of Mansory or TechArt in order to have them build something with a little more pizzazz. Aside from obvious differences in design philosophy and product range (Mansory will work on more than just Porsche models), both tuners enjoy building wide-body kits, new body panels and, of course, highly customized interiors. Let’s talk about TechArt first, since they undercut Mansory with their GrandGT version of the Panamera Sport Turismo by a few weeks, having been launched at the beginning of 2018. The GrandGT is actually a very popular kit among Panamera tuning enthusiasts, since it’s long been available for regular versions of Porsche’s luxurious four-door fastback. Opting for the GrandGT treatment means having TechArt install a wide-body kit, which is comprised of extended wheel arches, side skirts, new spoilers and vents. Then you have the 22-inch Formula IV wheels, carbon fiber exhaust tips, custom badges and a lowered ride height. Add it all together and you could say that nobody would ever dare call your Panamera Sport Turismo bland. You even get a performance tune, where an ECU upgrade and a titanium sports exhaust system boost the Panamera Turbo’s total power output from 550 PS (542 HP) and 768 Nm (567 lb-ft) of torque to 640 PS (631 HP) and 900 Nm (664 lb-ft). It’s definitely more than you get in the Mansory version, which only packs an extra 35 PS (34 HP) and 40 Nm (29 lb-ft) of torque. You have probably figured out by now which of the two is more intent on looking and behaving more sporty compared to its factory standard version. When it comes to luxury products, the more expensive something looks, the more respect it tends to earn. Just look at all the custom carbon fiber pieces on the Mansory-tuned model: front apron, hood, vent inserts, mirror casings, side skirts, diffuser, rear apron, two-piece roof spoiler. Even if you don’t love it, you have to admit that it’s a very unique take on the Panamera, especially since this one also comes with a wide-body kit and a set of fancy five dual-spoke gold wheels. The same extravagant design philosophy can be found inside, where the Mansory Panamera Sport Turismo boasts leather-wrapped seats and other surfaces, with carbon fiber also present on the gear lever and the steering wheel. The TechArt version on the other hand has a more straight-forward cabin, clearly angled towards offering a sportier vibe, with plenty of leather, Alcantara and a more aggressive contrast stitching pattern. In the end, to make this easy, we’ll just frame the question like this: If you happened to own a Panamera Sport Turismo and had to choose one of these two versions, which one would you go for, and why? 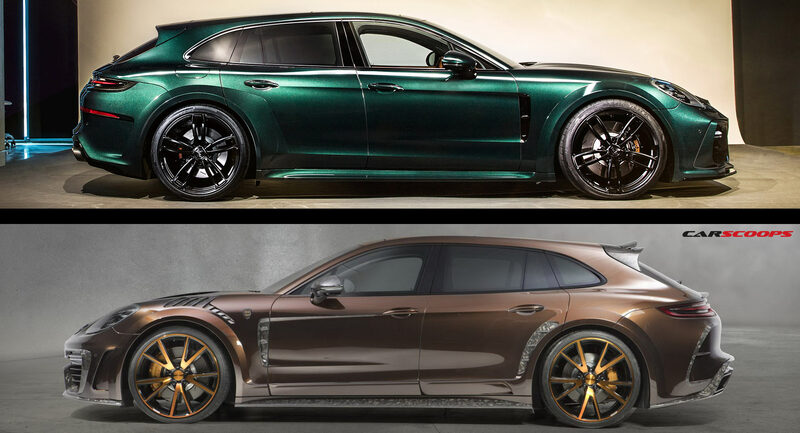 Vehicle Traveller Would You Rather Have TechArt Or Mansory Style Your Panamera Sport Turismo?